produce high-quality publications on the history of the town. Hitchin is a medieval market town about 50 km north of London, in the county of Hertfordshire and in the administrative district of North Hertfordshire. It is about 5 km from Junction 8 of the A1(M) and is served by Great Northern trains from Cambridge, London (King’s Cross) and Peterborough, and by Thameslink trains from London (St Pancras) and stations on the Brighton line: train times can be found here. It is 10 km from Luton Airport. Hitchin has retained much of its historic character despite enormous growth since the 1850s. 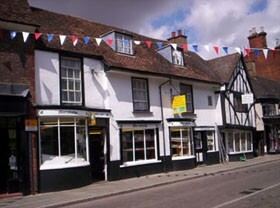 It is noted for its specialist shops, the largest parish church in Hertfordshire and its attractive streets. Known to have existed since at least the eighth century AD, it is one of the oldest towns in the county. Our membership is over 400, and increases year on year, so we’re popular. If you’d like to join the Society you’ll be very welcome. A reference or link on this website to any commercial products or service does not constitute or imply its endorsement or recommendation by HHS.